I am looking to see if anyone can identify the following hallmark on a tea service given to me by my grandmother. The mark is an "M" on the left, Fleur de Lis in the center, and a crown over letter "C" on the right. Any help would be appreciated. Thanks! Bad news unless someone else has found it recently. My wife and I have come across a set with these markings as well. Its a 7 piece set that has a stand for the tea pot with what looks like a warmer under the base. Its a beautiful set we would love to learn more about but no one seems to know who the maker is. Ours has the M, Fleur de Lis, Crown over C marking with the words "Silver on Copper" underneath. We found this link that lists a set as Winthrop by Reed & Barton. But in my research have found that Reed & Barton use much different marks and other sets were clearly labeled "Winthrop". Last edited by dragonflywink on Sun Oct 14, 2012 11:55 pm, edited 1 time in total. So far as I know, this mark, with at least two distinct variations, has still not been attributed to a particular manufacturer - Reed & Barton seems extremely unlikely. Well now, it's 2016 and still no one has an answer to this hallmark and I've just come across a Carafe with a silver-plated lid, wrap and ornate warmer base. I love it. It is clearly marked M, Fleur de Lis, Crown over C with the word Silverplated below it. If anyone see this and has an answer…. Bump. I have the same plate and marks but in reverse order. Any new thoughts? Not reversed, but an actual mirror image. Notice areas recessed in stamped versions are raised on yours? 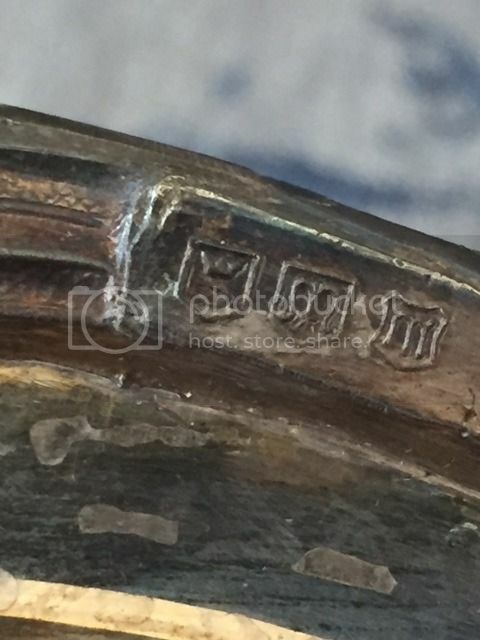 Therefore, this was cast/stamped where a lower plate (the back side) had the mark in it already. Just guessing, but looks like maker became more automated in producing their items, eliminating the need to stamp each piece. We'll have to see if this recurs. I have recently come across a silver epergne which has these same marks: M + FLUER DI LIS + Crown over C.
The piece seems to be solid silver, not plated, and the silver is soft. I even believe it maybe coin silver. The piece is not very large but its base is heavy. Three arms with silver bowl/candle holders radiate from the y shaped base and a center fluted column with 2 cherubs support a shallow silver bowl. I have exhausted my search for the maker with no luck. How can I be sure it is solid or if it is coin? Hi, welcome to the forum. As stated above a row of unknown silverplate marks. Not solid silver nor coin silver but an non precious white base metal, silver plated. I also have a piece with these markings. I have search high and low for more information on this maker. This is the only place that I’ve found that anyone else has pieces with the same mark. My piece feels heavier than my other silverplate items. It’s weight matches more with my silver on copper pieces. Has anyone found the answer to who made this? Please start a new topic with images of your item and the marks for a much better chance of getting a response. ive got the same stamp but the C under the. Crown almost looks as if it could be a G. Not sure how to share the image on this site. I am reporting this same hallmark. It is the lower of the two images in dragonflywink's post. Could it be gold plated? Any approx date for this mark?